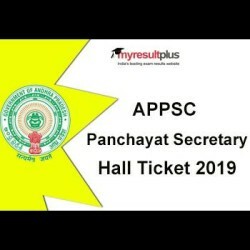 The APPSC Group 3 Panchayat Secretary 2019 exam hall ticket is likely to release today, April 15, 2019. The admit card will be released by the Andhra Pradesh Public Service Commission (APPSC). The APPSC Panchayat Secretary 2019 admit card is available on the official website, psc.ap.gov.in. The candidates who applied for the Group 3 Panchayat Secretary exam can visit the official website to download the hall ticket. Earlier the authority has issued a press note stating, "It is hereby informed that hall tickets for Screening test (Offline) to the post of Panchayat Secretary (Notification No. 13/2018) which is scheduled to be held on 21-04-2019 are hosted in the commission's website i.e., https://psc.ap.gov.in, from 15-04-2019 for downloading." If you are one of those candidates who have applied for the exam should follow the steps mentioned below to download the Admit Card from the official website. Step 2: Click on the link scrolling on the homepage that reads, "Panchayat Secretary 2019 Admit Card"
Step 3: Now click on the "Panchayat Secretary 2019 Hall Ticket Download Link"
The candidates having Hall Ticket will be allowed to appear for the examination.